I got this Swobo Sanchez Frame set for Father’s day from Banning’s Bikes in Fullerton. I had been riding the Raleigh One Way, but unfortunately the frame was a tad too big for me. I transferred the wheels, crankset, chain and pedals from the One Way to the Sanchez, I installed a shortened MTB flat bar, a carbon fiber post and a Brooks Saddle. Thumbs up:I really like riding the Sanchez. The frame is comfortable and rides super smooth. The galvanized finish gives it a different look and I don’t have to worry much about scratches. The Swobo comes with no brakes, but the front fork is drilled for one and not wanting to become pavement tortilla, I installed an XTR lever matted to a Powertools brake caliper. Stopping power is awesome. Thumbs Down:The bike is not drilled for water bottle cages, so I ended up installing one on the handlebars. My commute is 21 miles round trip so I do have a need for hydration. Do I recommend the Sanchez? In a world full of conversions and Pistas, the Sanchez dares to be different. Although the complete bike is a little trendy for my taste, buying the frameset and building it up to one’s liking is totally recommendable. Are you looking for the perfect bicycle frame? We have a large inventory to choose from.. But where is the LA model? or the SFO model? or the Hollywood model? What? Are we not ‘hip’ enough? Are you wondering if the bubble of the Fixie Trend is about to burst? Check out BSNYC’s PistaDex. A couple weeks ago, my friend Davey called me and said that he was bringing a couple bikes down for me to use as projects — a fairly new Trek 4500 mountain bike that had been slightly damaged in a car accident, and my old faithful, a 1984 Trek 460 road bike. I moved to Florida in 1992 with $70 in my pocket and my only possessions being a suitcase of clothing, a box of bike tools, a rusted-out International Scout and a 4-year-old Schwinn High Sierra mountain bike (in classic “smoked chrome”). Within the first year, that Schwinn was stolen out of my garage — I lived in a really bad neighborhood in Sarasota, and things had a way of disappearing around here unless they were within eyesight. A coworker at the health food store I was working at told me he had an old Trek road bike that he’d sell me for $75.00. I really needed a bike to commute to work and to the beaches, so I jumped at the chance. When I got the bike, it was in virtually new condition — the paint was pristine, the decals and headtube badge were intact, and the components were in good shape. The bike had been somewhat clumsily converted into a 1×6 drivetrain when the previous owner lost the shift lever for the front derailleur. This Trek is a bit unusual because it represents one of Trek’s first forays into foreign production. 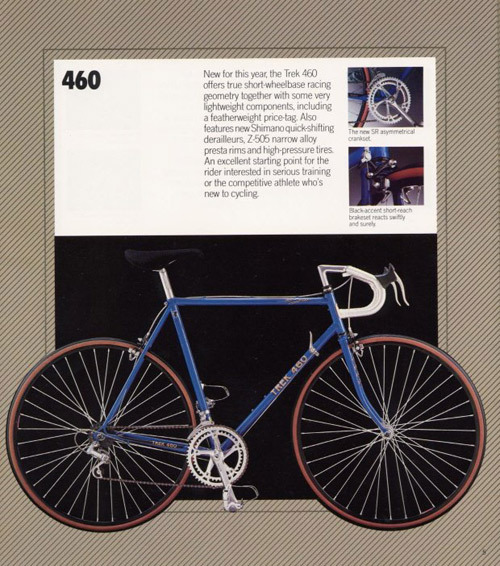 From 1984 until 1986, a factory in Japan produced several models for Trek. This is one of those Japanese babies…True Temper tubing, clean lugwork and all the bells and whistles one might expect from a midrange road bike. I rode that bike for most of 1993…numerous trips to the beach, daily commuting to my crappy job, etc. One day at work, I found another bike in the dumpster behind our building, and I converted that one into a commuting machine. Since I didn’t really need that Trek anymore, I sold it to someone for $60. Six months later, that person sold it back to me for $25. Two months later I “leased” it to a friend who had just moved to Sarasota…he gave me $20. Five months later, he decided to move back to NYC so he gave the Trek back to me with $20 and some other incidentals. I sold it to someone else I worked with for $40, and bought it back for $25 about three months later. 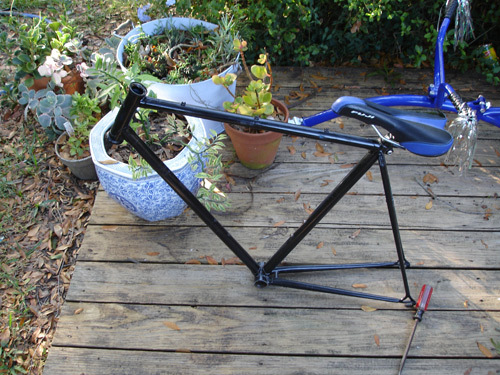 I just could NOT get this bike out of my life…until a couple years after that, when I cleaned the bike up, rebuilt some components and sold it to my friend Davey for $125. 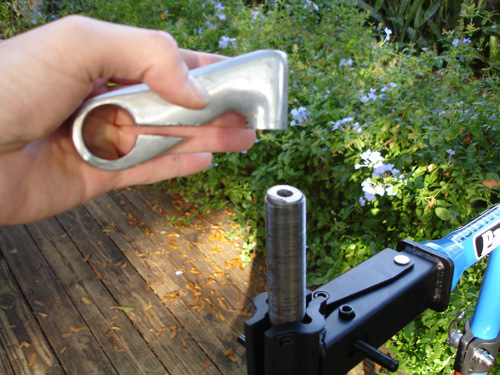 Years of neglect and a poorly-fitting headset locknut allowed sweat and rainwater into the fork, effectively freezing the stem into the steerer tube. The bottom bracket was shot — both bearings and cups were badly pitted. The wheels were shot. The handlebars had a hairline crack in them…and this bike had been repainted a couple times — painted right over the original decals and headtube badge. Ugh. I hacksawed the head off the stem and went to work with a 1/2″ drill bit, a hacksaw blade holder and assorted rasps and files to drill out the remainder of the stem’s quill. After literally 6 hours of drilling, cutting and filing, I was tapping out a large piece of aluminum when the steerer tube split right at the keyway, effectively ruining the original fork. Over the next couple months, I will be rebuilding what’s left of this bike into a fast weekend commuter — stealth-mode all the way with a fixed/free singlespeed drivetrain. Stay tuned for all of that, and remember, if you have a bike with a quill stem, DON’T FORGET TO GREASE THAT QUILL from time to time, or you will be faced with some ugly surgery, too. 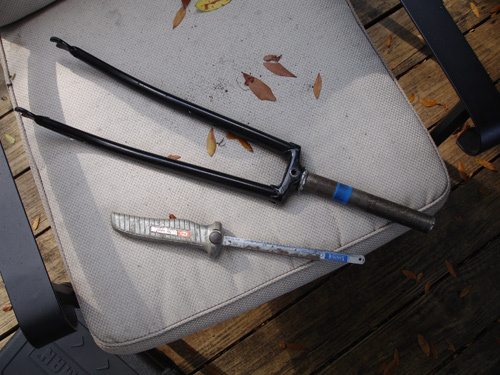 By the way, anyone got an old steel Trek fork laying around? You know, one with at least 180mm of steerer and at least 50mm of threads? If so, let me know and I’ll make it worth your while. Trek recently released a new bike called the Soho. They have a few models in this line. 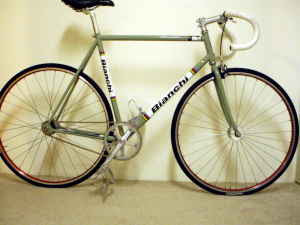 It varies from geared to a flip flop single speed/fixie. It’s a sharp looking bike. The price tag is about $549.00. This bike is somewhat comparable to the Redline 925, but the 925 is only $499.